The middle part of the book of the prophet Isaiah contains four poems that we now call the songs of the suffering servant. His suffering wasn't punishment for sin. It mysteriously offered justification to others. Jesus, and the gospel writers, meditated on these passages. The author of the Letter to the Hebrews writes to Jewish converts who had been cut off from the comforts of their historic roots. Today he explains why Jesus is a greater priest than the priests they had lost in Judaism. In two related sayings, Jesus asks his disciples to think differently about their status and ambition, and to choose their place in light of his own coming suffering and death. Our Liturgical Setting: As usual, the first reading prepares us to hear today's gospel, Mark 10:35-45. That passage seems to be about ambition and dominance versus humility. But two portentous sentences in the middle and one at the end get at the real message of Mark's gospel, that Jesus accomplishes his mission not by working miracles and teaching, but by suffering, dying and rising. Those are what give weight to Jesus' teaching about humility, and make this first reading so appropriate. Your Proclamation: Read this slowly and solemnly. Not too solemnly, though, because there are four things mentioned that the Servant can hope for: to see his descendants, that the will of the Lord shall be accomplished, to see light, to justify many ("The righteous one, my servant, shall make many righteous," as another translation has it). * "The main thought is that the Servant is to be the instrument in establishing the true religion, by removing the burden of guilt and bringing many to righteousness. As the reward of his sufferings he will enjoy a brilliant future and have a numerous spiritual offspring. He will become a great power in the world, attaining a position like that of a mighty conqueror. The idea of a resurrection from the dead appears to be necessarily implied." J. Skinner, The Book of the Prophet Isaiah: Chapters XL-LXVI: Cambridge University Press, 1954, p.146, cited on Dan Nelson's page (locally cached). The Historical Situation: Remember that the Letter to the Hebrews was written to bolster the faith of Jewish converts to Christianity; they suffered the contempt of old Jewish friends who had not converted, and felt nostalgia for institutions of Judaism (rituals, sacrifices, priesthood, etc.) that were absent or greatly transformed in their new religion. This letter tries to show them how they have it better now than they did before. 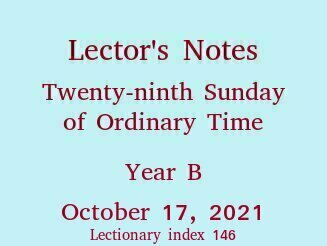 (For more on this, see last week's Lector's Notes). In the early Christian milieu where this was written, "priest" still meant the priests of Judaism. (Leaders of the nascent church were the overseers (bishops) who succeeded the apostles, and, on the more local level, elders who had not taken on the title "priest" yet.) The Jewish converts to Christ don't have anymore the priests they were used to. The author of Hebrews argues that Jesus is priest enough for them, and a better one than the ones they've lost, because He is so much like us in our fragile, suffering humanity. We can approach his throne of grace confidently because he understands us. The Theological Background: So logically, what's going on here? The writer is worried that some in his audience are going to abandon the faith. To warn them, he appeals to the memory that many Israelites were unfaithful during the Exodus, and God prevented them from entering "the rest" that was their destination in the Promised Land. (Then the author meanders into a discussion of Sabbath rest, starting with God's resting after six days of creation.) A third rest is our hoped-for rest in heaven. That's where Jesus, our high priest, has already preceded us, "we have a great high priest who has passed through the heavens," he says. That our priest is already there and that he has these qualities that make him sympathetic to us (he was tempted, too, "tested in every way") should keep us from abandoning our struggle. Let us hold fast to our profession of faith, as an older translation has it [confession, in the NAB translation, means profession, not admission of guilt]. Your Proclamation: I would prepare to proclaim this by meditating a while about the congregation who is to hear me, and my place in that assembly. To some extent, we're all struggling, tempted to give up, nostalgic for things we'll never recover, tired of our journey, coping poorly with rapid change. We've been steeped in many propositions about Jesus over the years, emphasizing different aspects of the mystery that is Christ. Today we need to be reminded that he shared our struggle-prone human nature fully, and that he's reliably loyal to us. So you'll speak confidently, of course, but your confidence will be suffused with sympathy, for you and your listeners are in the same situation, the same one that Jesus chose. 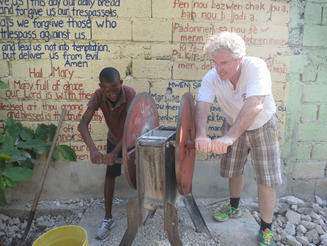 The Haitian Project is an effort to bring education to the children of Haiti. The photo is from the Project's blog.